Start a faceoff involving your characters at a Problem and an opponent's characters there. 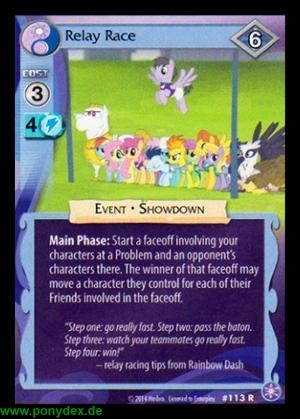 The winner of that faceoff may move a character they control for each of their Friends involved in the faceoff. "Step one: go really fast. Step two: pass the baton. Step three: watch your teammates go really fast. Step four: win!"